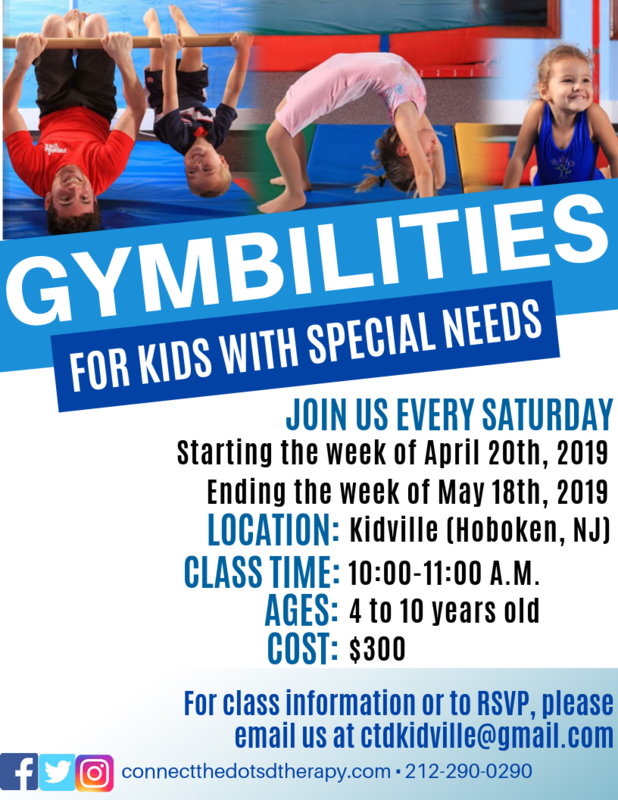 Join our Gymnastics Class for Kids with Connect the Dots Occupational Therapy ! The kids had a blast in our first session of Gymbilities. Our second season starts April 20th! Our Connect The Dots OT, PLLC Lindsey Britt, who has experience with coaching as well as competing in gymnastics, will be returning to lead classes, along with several occupational therapy student interns! We are offering a $50 early registration discount with code “Gymbilities50” if you register by April 12th. The final day to register would be April 17th. The class dates are April 20th to May 18th (Saturdays from 10 – 11AM) at Kidville (Hoboken, NJ). Email us at admin@ctdtherapy.com to RSVP! CTD has been established since 2005, collaborating and connecting the dots through Occupational Therapy Evaluations and Therapy sessions throughout NYC and Hudson County, New Jersey.